In 1987, Michael Jackson’s music video titled Smooth Criminal invited admiration and became viral worldwide. 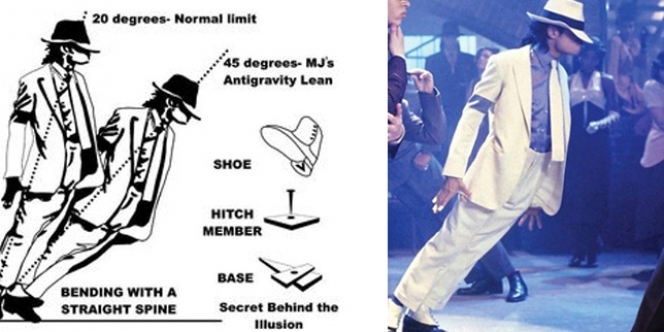 In the video, Michael performed an unusual dance, as if against gravity. He tilted his body to 45 degrees with the condition of a straight back and feet stepping on the floor. Many later tried Smooth Criminal dance but failed. Most even reportedly suffered injuries. Michael’s dance was amazing. Not only the people of the entertainment world are interested, but also many scientists who are interested in learning it. One of them is a group of neuroscientists from the Institute of Postgraduate Educationand Indian Medical Research, who wrote a research on the secret of Michael Jackson’s antigravity dance movement. “Actually the antigravity dance movement can tilt 45 degrees, it can’t be done normally,” said the neurologist. Even though they knew that the antigravity dance movement was also helped by special shoes. But to be able to tilt in a straight position is difficult for untrained people like Michael. Michael’s fans, including the writers, claimed to have tried to imitate the style and they failed. Some of them are even injured in the process of imitating it. “So, even with specially designed footwear, this movement is very difficult to do. The movement requires strong spinal muscles and lower leg muscles,” the experts in the study wrote. The researchers even found the fact , to keep his position straight even though he was tilted, Michael rested on the Achilles tendon on his leg. The Achilles tendon is the tendon on the back of the leg. Without special shoes, even a professional dancer can only tilt at a maximum angle of 25 to 30 degrees. According to researchers, Michael Jackson challenged the understanding of spinal biomechanics, which plays an important role in medicine. “Using tricks or not, Michael has challenged our understanding of the modes and mechanisms of spinal cord injury,” the researchers wrote. The researchers revealed that since Michael performed amazingly at Smooth Criminal, professional dancers are inspired to jump higher, stretch further, and spin faster than before. “This is the reason we conducted research on Michael’s antigravity dance, which is to determine how spinal surgery for professional dancers can change in the future. “The rapid progress in the world of dance as an art and sport throughout the world will surely produce new forms of injury, which may confuse neurosurgeons,” the researchers concluded in their study. Research by neurologists from India has been published in the Journal of Neurosurgery: Spine. Archaeologists in Israel found rare artifacts while digging in a parking lot in the City of David, Jerusalem. Clay objects are believed to have originated in the 9th or 10th century. According to Al Arabiya’s website , as quoted by Dream , Friday, June 22 2018, it was a talisman. The pottery with Arabic writing is believed to be a talisman that was once used to protect its owner. The suspicion is based on the sentence on the pottery called ‘Kareem’. “Because you believe in God , the Lord of the universe is God,” the sentence meant to the artifact, as translated by Nitzan Amitai-Preiss, a scientist from Rothberg International School, Hebrew University. The amulet was found between layers of cast during excavation in a small room at the Givati ​​Parking Lot in the City of David, in the Jerusalem Walls National Park. However, experts cannot ascertain whether this amulet is intentionally buried or lost from its owner, who is believed to be named Kareem, because there is no hole to tie it. Therefore, the researchers assume this talisman is part of jewelry or objects placed on a container. 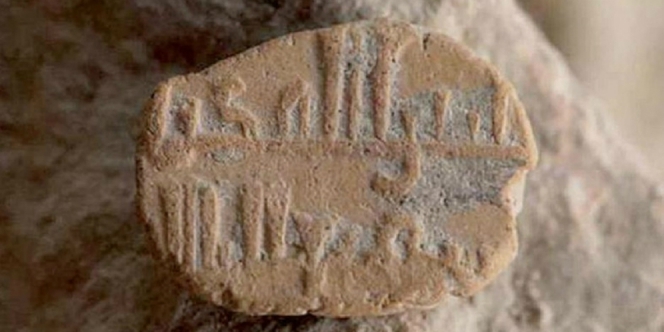 According to Nitzan, the invention stamp made of stone semiprecious stones with the writing of the Abbasid era very prevalent. But for thin clay objects such as these findings is very rare. To the Haaretz newspaper, they said, “The purpose of a talisman like this is to get personal protection.” This amulet is believed to have been used since ancient times to seek protection from bad people. Researchers at the University of Wisconsin-Madison, United States, have discovered new facts about the Moon. According to them, about 1.4 billion years ago the Moon orbits closer to planet Earth. It changes the way the Earth rotates on its axis. At that time in a day it only lasted for 18 hours. The latest research also says that the Moon will continue to move away from Earth, making the duration of the day longer. “When the Moon moves away, the Earth is like a skater who rotates more slowly as they stretch their hands,” said Stephen Meyers, professor of geoscience at the University of Wisconsin-Madison and research author. To understand how the Moon’s orbit affects the rotation of the Earth, Prof. Meyers and his team use astrochronology. Astrochronology is a statistical method that links astronomical theory and geological observation, to reconstruct the ancient history of the solar system. “One of our ambitions is to use astrochronology to observe the farthest time in the past, and to develop a very ancient geological time scale. ” We want to be able to study billions of years old rocks, in a way comparable to the way we study modern geological processes , “explained Prof. Meyers. One way Prof. Meyer was able to make calculations about the rotation of the Earth more than a billion years ago was, by examining sediments in rocks aged 90 million years. After that he used information from the stone to find out about the planet’s climate cycle in the past. 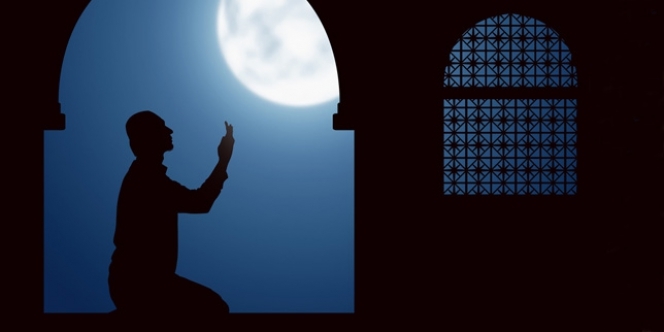 The moon is believed to be moving away from Earth at a rate of 3.82 centimeters per year. So it takes hundreds of millions of years before the Moon is far enough for humans to recalculate how long it will take in one day in the future. “Geological recordings are astronomical observatories for the early solar system. We are looking for pulsations of rhythms preserved in rocks and the history of life,” he added. Prof. Meyers’s research has been published in the journal Proceedings of the National Academy of Sciences. NASA’s Latest Photo Reveals Life on Planet Mars? Some of the latest photos released by Curiosity Rover, the vehicle of the United States Space Agency (NASA), on Planet Mars have sparked debate among netizens. The photos in the form of videos show the shape of an animal that is walking on the surface of the red planet Mars. Quoted from the Mirror , Thursday, June 21, 2018, conspiracy theorists claim the photo is evidence of Mars inhabited by living things. However, that evidence has not been ascertained because the planet has been hit by a massive dust storm in the past few weeks. This condition triggers the question of whether the object is really an animal or just a collection of dust. The photos are shown side by side on the SecureTeam 10 YouTube channel that specializes in UFO sightings . The appearance of objects in the video immediately caused debate among YouTube users. “What if there were other intelligent civilizations researching Planet Mars with us?” wrote a netizen. “What if Mars had a life like on Earth but something destroyed it and now started a new life from scratch,” wrote another netizen. NASA reports that Mars has been hit by one of the thickest dust storms ever observed on the planet in recent weeks. As a result of the fierce storm the vehicle Curiosity Rover had to delay its exploration on Planet Mars for a while. To observe Planet Mars, NASA has sent three satellites, each equipped with a special camera and atmospheric monitoring device. Author adminPosted on 26th August 2018 26th August 2018 Categories OthersLeave a comment on NASA’s Latest Photo Reveals Life on Planet Mars? For ordinary observers or lay people, thousands of crooked trees scattered throughout North America are formed by natural factors or attacked by strange diseases . However, a more in-depth analysis reveals that these trees are bent intentionally at a 90 degree angle and parallel to the ground. While the purpose of the trees that have been bent for hundreds of years is also unknown until now. This bent tree, better known as a trail tree , does have a very specific form. With a height of about 1.2 meters to 1.5 meters above the ground, a sharply bent tree trunk forms a 90 degree angle and is parallel to the ground. The stem then bends up again. Many suspect this strange form is caused by nature such as lightning strikes. But there is another characteristic of this mysterious tree that has no damage marks on the bent part. Scientists have not agreed that this is evidence that the trees were deliberately bent by humans centuries ago. But there are those who believe that the strange tree was deliberately bent to be used as a marker by hunters and food gatherers . The belief of the tree was deliberately bent revealed by an artist named Dennis Downes. He heard stories about Native American tribes living around the Great Lakes. According to the story , the Native Americans bent the trees as markers to find a safe secret path through the forest. Out of curiosity, Downes wanted to reveal the mystery of the crooked tree itself. In his investigation, Downes discovered the writings of Raymond E. Janssen, a geologist who worked in Illinois between the 1930s and 1940s. Like Downes, Janssen was also fascinated by the strange shaped trees he saw in the forest. Janssen even traveled to 13 states to learn more about the trees. Janssen finally concluded that these trees might not have different forms just because of chance. He described the trees as ‘intentionally preserved artifacts’. “Among the many crooked trees that I met, only a few were markers of the Indian tribe. Ordinary observers often have difficulty distinguishing between trees that accidentally change shape with those intentionally bent by Indians, “explained Janssen. According to Janssen, lightning can split the stem, causing some to fall or lean in such a way as to resemble the markers of Indian tribes. Wind, snow or animals can cause the tree to experience accidental changes in shape. However, it certainly leaves a clear mark. This is what distinguishes these trees from the markers of Indian tribes. Downes finally went alone to the US and hopes to uncover the mystery of this crooked tree. Earl Otchingwanigan, a professor and consultant at the Smithsonian Institution, showed Downes a tree that had been bent in 1933. 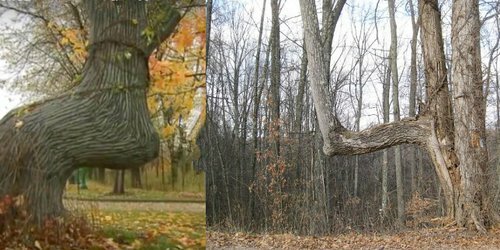 The old tree was bent by two 70-year-old Indian tribes who had learned the practice from their ancestors. Evidence like this is what convinced Downes, at least some traces of trees had been intentionally bent in the past. Many academics still doubt that the trees are bent by native Indians to serve as a marker. But Downes and other researchers believe that the network of trace trees is deliberately formed in this way. “There are still skeptics out there, especially in academic circles. I have spoken with the elders, and I know the truth. I just ignored them, “said Don Wells, who has found traces of trees in Georgia since 2003.